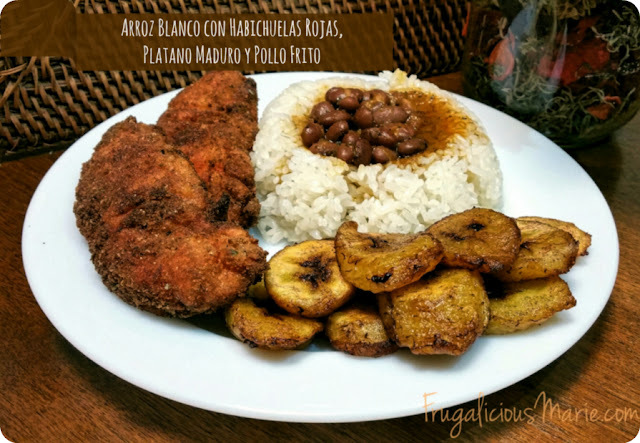 Recipe of the Day: Arroz Blanco con Habichuelas Roja, Platano Maduro y Pollo Frito! Being Spanish has it's perks. I am Puerto Rican and hail from the island of Puerto Rico. On my island we have so many different dishes. One of my favorites is White rice with red beans, fried cicken cutlets and fried yellow plantain bananas which translates to Arroz Blanco con Habichuelas Roja, Platano Maduro y Pollo Frito in spanish. I will tell you how to make this lovely dish so you could spoil your significant other or friends! Sofrito -- mine is homemade but you can buy store bought. In a medium caldero (spanish rice pot), pour 1/4 cup of canola oil, 2 cups of white rice, 2 1/2 cups of water, and salt to taste. The water should be right above the rice. Cook on medium heat until the water evaporates then cover. Turn down to low heat, cook for about an hour. Move the rice around on occasion so that the rice is cooked evenly. In a small pot add 1/4 cup of canola oil, half a can of Goya salsa, 2 tablespoons of sofrito, 1 teaspoon of Goya adobo, a can of Goya Beans, and half a pack of Goya sazon. Fill the can with water and add to small pot. Mix around and cook on low to medium heat for about 40 minutes. You could add some cut potatoes or olives. Set aside 3 little bowls. 1 with flour, the other with 2 eggs, and the last one with seasoned bread crumbs. Season with Goya adobo and Goya sazon. take the chicken tenderloins and dip in flour, then in egg mix, and then cover with seasoned bread crumbs. Fry the chicken tenderloins for about 15 minutes on both sides. place chicken on a plate lined with paper towels so that all of the oil is soaked up. Cut the ends of the plantains and make a slit down the middle. Cut at a slant and put them in the bowl. This prevents them from turning black while waiting to fry them. Next you'll want to make sure your oil is at a medium-high heat. Fry the plantains until a golden brown. Now you can serve the family and enjoy!